White polypropylene sandbags, 14"x26" - $0.65 ea. Our basic bag. White woven polypropylene, 10x10 weave, 850 denier. These come with tie strings and are treated with 1,600 hours of ultraviolet inhibitors (UVI). Nearly waterproof & highly resistant to tears and punctures, but with a short lifespan. 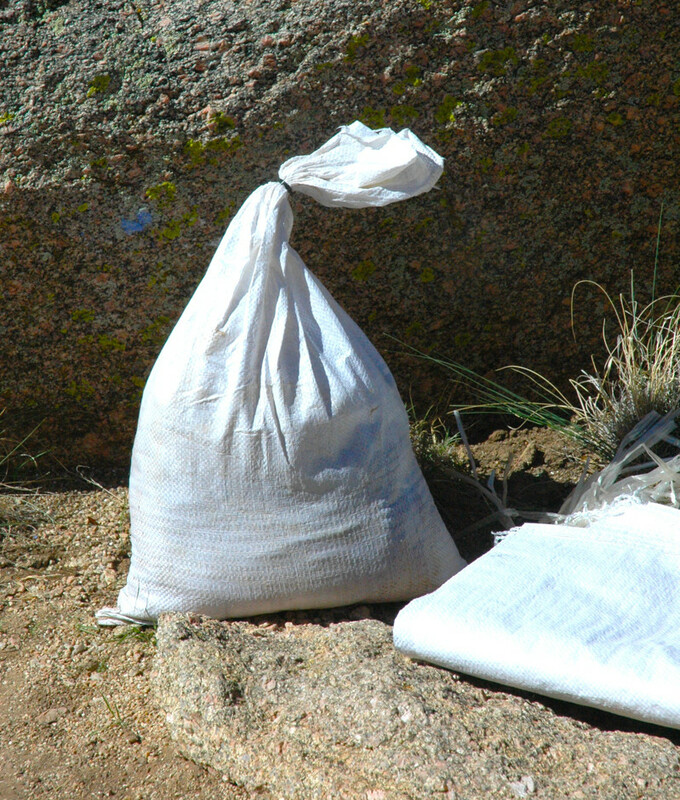 These bags are best for either earthbag construction where they'll be plastered, or for short-term purposes (eg, constructing temporary barriers or for flood control). Please take note that these bags will start to deteriorate after several weeks to several months (depending on how much of the sun's infrared and UV they're exposed to). Store them out of the sun, and keep them covered with tarps, black plastic or earth to prolong their life. These are best suited for temporary or seasonal use, unless you intend to plaster or stucco them. These bags can hold up to about 50 lbs. of fill. When they've reached the end of their lifespan, they can be recycled with common household plastics ).